[WINDOWS 10] I was getting ready to create a video for Tech-Talk and I needed my Camtasia software program to open. I use it every week, but apparently not frequently enough for it to pop up in my Start Menu’s “most used” list. Of course, taking the time to set this up when I first installed Windows 10 might have been smart, but it’s not too late. It can really pay off when you learn all that a program can do and set it up to work efficiently. So I took some time to organize my Start Menu to make it more productive for me. I’ll share with you. Get a cup of coffee, put a do not disturb sign on your desk for 10 minutes, and let’s look at a handful of features you can adjust to make Windows 10 work better for you. First of all, if you are new to Windows 10, here’s a quick refresher of how it differs from older versions. 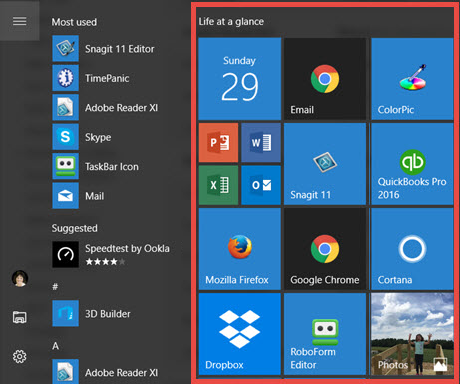 An updated Start menu in Windows 10 brings back the features that what we were used to in Windows 7 — yet incorporates the tile look of Windows 8 (square and rectangular boxes instead of words). Here’s a quick comparison to make it easier for you to adjust to the new style. 1) A list of software programs on the left. 2) Two ways to search your programs at the bottom. 3) A list of feature groupings on the right. 4) Choices for powering down. In Windows 10 when you click the Start icon in the lower left of your screen (no longer brightly colored and in a circle), you’ll find the same things, just arranged in the newer “mobile” look and grouped into named categories. NOTE: There have been updates to Windows 10 since its release, so in the newest version a third column has been added (you used to have to click on the Expand button at the top to see these options). Your icon – based on the Microsoft account that you have singed in under. File Explorer – click to get access to all your folders and documents. Settings – where you will find much of what is in the Control Panel. Power options – choose sleep, shut down or restart. Most Used – where you’ll see the last six or so programs / apps you’ve engaged. 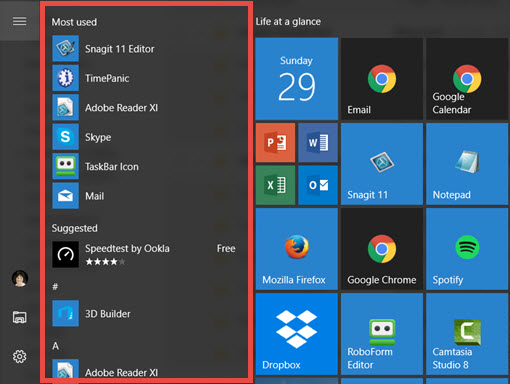 Suggested – where Microsoft suggests other apps that may interest you. NOTE: you can turn this off by going to Settings, Personalization and in the Start section, change this option to Off. 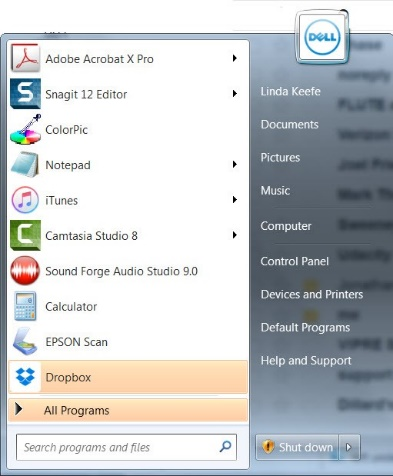 All Apps – find all your software programs listed alphabetically. 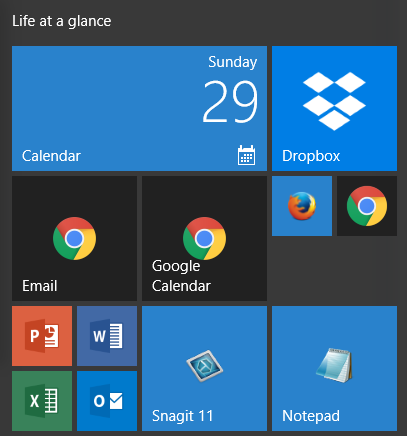 Life At A Glance / Colored Tiles – the commonly used tools and folders such as calendar, email, internet browser, photos, music and so on – shown as You’ll notice the “tiled look” that migrated over from Windows 8. These are vibrantly colored squares / boxes for the programs, services and even web pages that you use the most. This (Life At A Glance) is where you can make changes to the programs, apps and even web pages to show what you use each day. For easy access, you can add, delete, resize and move these around. You’ll always have your Most Used apps appear ready for you to engage in the left menu, but let’s tailor the tiles you see on your screen when you click the Start button. 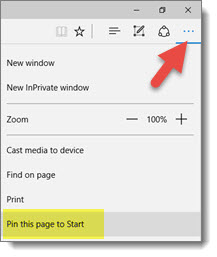 If there’s a tile displayed that you don’t need, right-click on top of it and simply choose Unpin from Start. 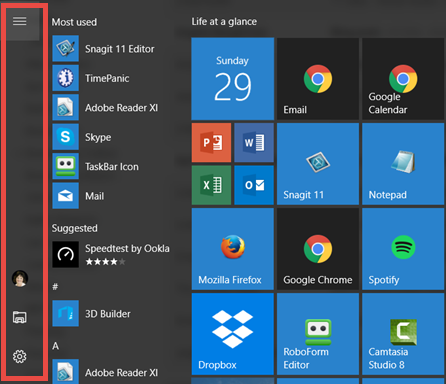 If the app you want to add is showing in the Most Recent section (and you want to make sure you always have it open), you can drag it over from the list on the left to pin to the Start menu as a tile (or right-click and choose Pin to Start). Or if you don’t see the one you want, go to All App to see the list in alphabetical order. When you find one you want to add as a tile, drag from left to right (or again, right-click and Pin to Start). TIP: If a folder icon is showing, you need to click the drop-down carrot beside it to show the app. Some programs are grouped in folders as they have multiple app options. Maybe you are always in one or two websites (e.g. Tech-Talk.com) and would like to save time getting to them each day. You can pin a website page to the tiled menu. The directions will vary based on what your preferred browser is. Edge – They’ve made it easy if you’re using the browser called Edge. Go to the page you want in Edge, click the ellipses (…) at the top right and then just click Pin this page to Start. Google Chrome – Open the website you want to add. Click the Menu button in the upper right (3 vertical dots), select More Tools and then Add to Desktop. Name the website shortcut and click Add. 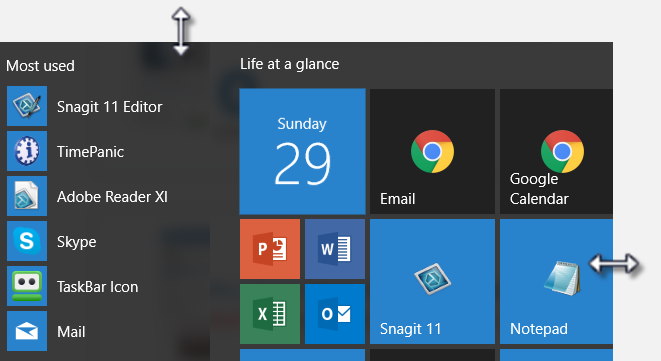 Then go to your Start menu and you’ll see it listed under Recently Added at the top. Drag and drop it to the tiles section (or right-click and choose to Pin to Start). The shortcut will also show on your desktop. 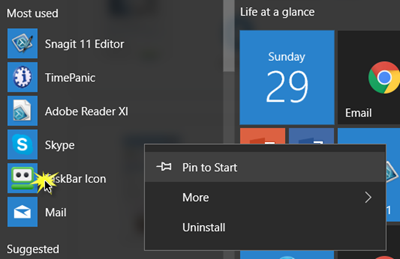 You can delete this icon after pinning to the Start menu. Firefox – There are not easy instructions to add a tile to open a particular website page with Firefox. You can of course add Firefox as a Life at a Glance tile, then use Favorites to quickly open a page using Firefox. If your Start Menu is getting full and you don’t want to have to scroll down to see all of the tiles, you can make this area larger. Click on Start to open it. Hover over the right edge (or top) until you see double arrows, then drag to the right (or up) to make the area larger. When you resize horizontally, you can increase by one full column of icon groups at a time – up to four columns. If you need even more room, you can change a setting to show a few more tiles in each column. From the Start Menu, select Settings, then Personalization and select Start from the left menu. Turn ON Show more tiles. 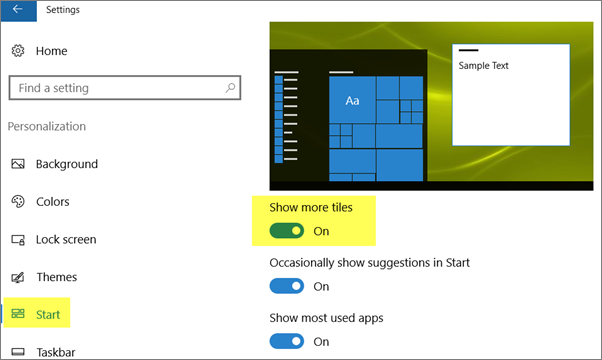 Once you’ve added several tiles to your Start menu, you can move them, re-size them and group similar ones together by dragging and dropping or using the options when you right-click on top of an app. To Resize, right-click on the tile and pick a size (small or medium… and sometimes wide is a choice depending on the app). 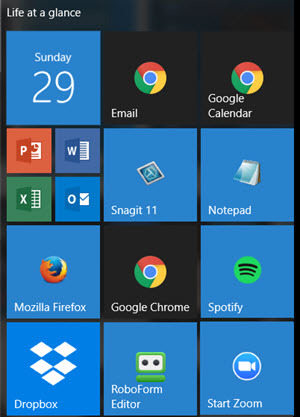 Group small icons in clusters to 1) save space and 2) arrange related apps together (like the Microsoft suite of programs). In the image to the left, you see small, medium and large tiles. You also see, groupings (or clusters) of “related” applications, such as Microsoft Office programs (PowerPoint, Word, Excel and Outlook) and Internet browsers (Firefox and Chrome). When you take a few minutes to customize your Start menu, it will save time in the future by giving you easy access to all of your most used programs and apps.